Mithun is a founding member of EcoDistricts, a nonprofit organization that assists cities, nonprofits, and the private sector to build equitable, resilient, and sustainable neighborhoods. Mithun’s 2003 Lloyd Crossing study explored “what would a LEED Platinum neighborhood look like?” This began the firm’s commitment to district-scale sustainable planning with an integrated approach to place, energy, water, waste, health, and biodiversity. 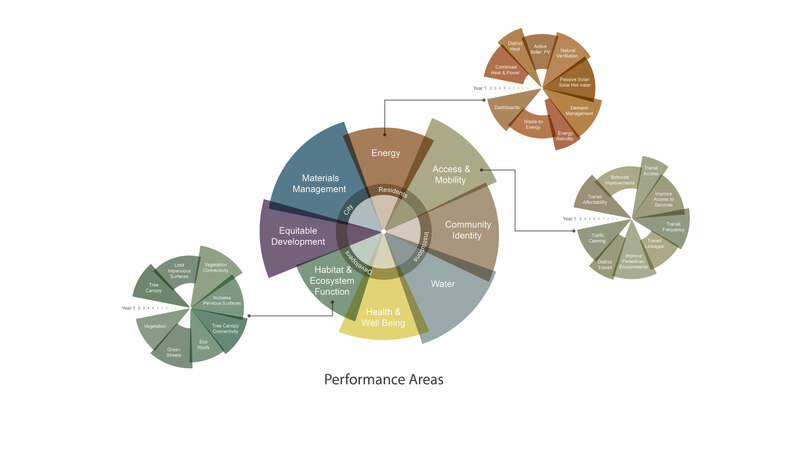 Mithun applied these lessons in developing the EcoDistrict Assessment Methods, a beta model for the current EcoDistricts Protocol. This guide combines data and engagement for districts to baseline performance and create a roadmap towards vibrant community outcomes. Mithun continues to support communities pursuing implementation and sustained success. Mithun led master planning for Sun Valley EcoDistrict in Denver and Little Tokyo EcoDistrict in Los Angeles, serves on the EcoDistricts board, and supports Incubator workshops.